The Skyline Sofa from Armen Living is sure to be the focal point of your home or office décor. With a sleek and uniquely curved silhouette, four strong and solid legs with a stunning and dramatic dark finish, and a beautifully tufted back, this sofa also offers two large and generously padded cushions offering maximum seating room. 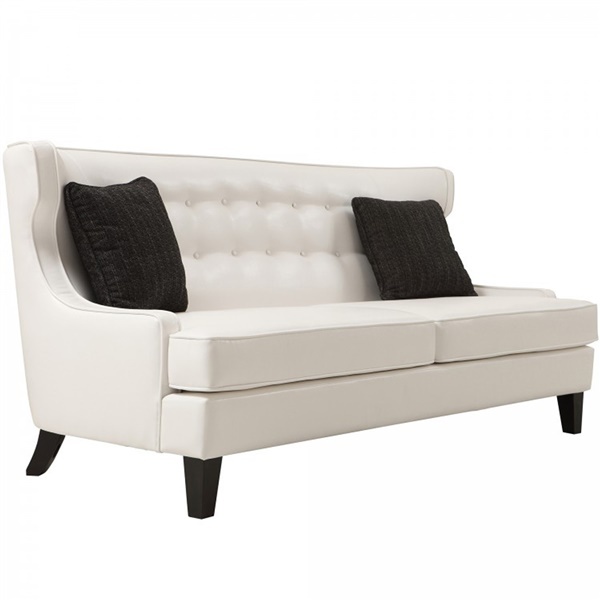 Upholstered in beautiful and clean cream bonded leather, the Skyline Sofa will have everyone fighting for a seat. Your choice of easy-to-incorporate colors. Unique silhouette for the contemporary or eclectic aesthetic. Durable wood legs with rich dark finish.